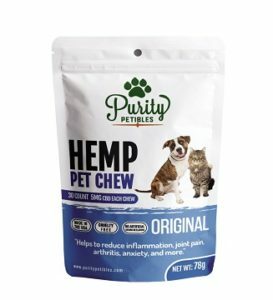 Most pets will love these cheese flavored chews, and each one of these treats are infused with 5mg of PRC Hemp Oil. The cannabinoids this oil contains are proven effective. Not all infused products with hemp oil are created the same. Full spectrum hemp oil can be useful with a myriad of conditions. Their oil is lab tested to a staggering 80.2% pure.